Luke Ruffing opened his round with a three-putt bogey, but after finishing runner-up the past two seasons, he was determined to let nothing stop him this time around. He began his back nine with four straight birdies and finished at 1-under par 71 to win the title by three strokes over Lincoln Academy’s Seward Matel. VASSALBORO — A shaky start did little to deter Maranacook senior Luke Ruffing from his quest to win the Class B high school individual golf championship Saturday at Natanis Golf Course. Ruffing opened his round with a three-putt bogey, but after finishing runner-up the past two seasons, he was determined to let nothing stop him this time around. He began his back nine with four straight birdies and finished at 1-under par 71 to win the title by three strokes over Lincoln Academy’s Seward Matel. Fort Fairfield junior Robbie Watson also shot 71 to win the Class C title while Chris Billings of Cheverus and Cam Letourneau each shot 75 to share the Class A title. The schoolgirl championship was also shared between Lincoln Academy freshman Bailey Plourde and Presque Isle’s Jenna Hallett who each shot 76. Ruffing began his back nine on the par 4 second hole of the Tomahawk Course by draining a downhill 15-foot putt for birdie. He followed that with a 12-footer on par 5 third hole for birdie and tap-in birdies on the par 3 fourth and par 4 fifth holes. With little wind and temperatures in the mid-60s, conditions were ideal. But Ruffing and Watson, who played the Arrowhead Course, were the only two to break par. Matel’s 74 was the next closest score. Several central Mainers fared well Saturday. 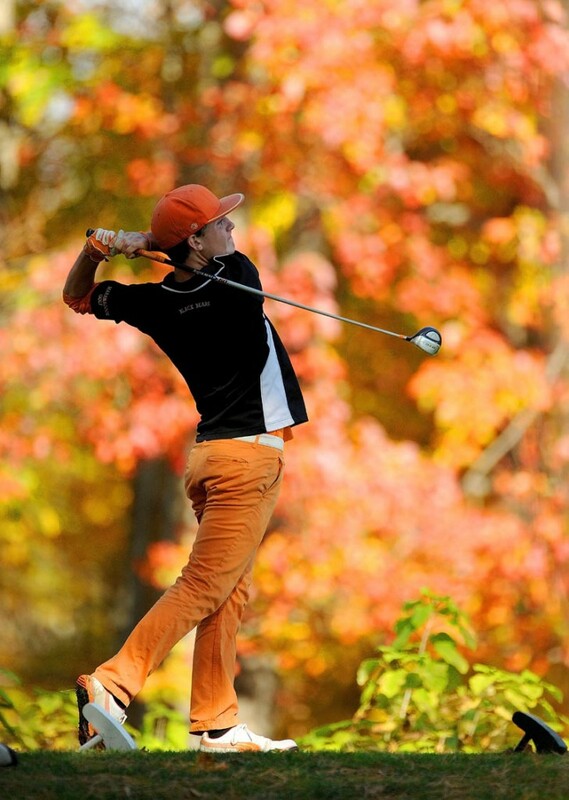 Winthrop junior Adam Hachey finished in a three-way tie for second in Class C with 76. His round included an eagle on the 255-yard par 4 sixth hole. Winthrop junior Taylor Morang finished a shot back at 77 to tie for fifth place along with Monmouth’s Robert Vickerson. Also in Class C, Madison’s Ty Cowan and Jared Miller each shot 85 while Forest Hills’ Brant Worster shot 98 and Winthrop freshman Zack Robinson 103. The battle for second and third was tight in Class B. Defending champion Reese McFarlane of Cape Elizabeth shot 75, as did Daulton Wickenden of Camden Hills. Mt. 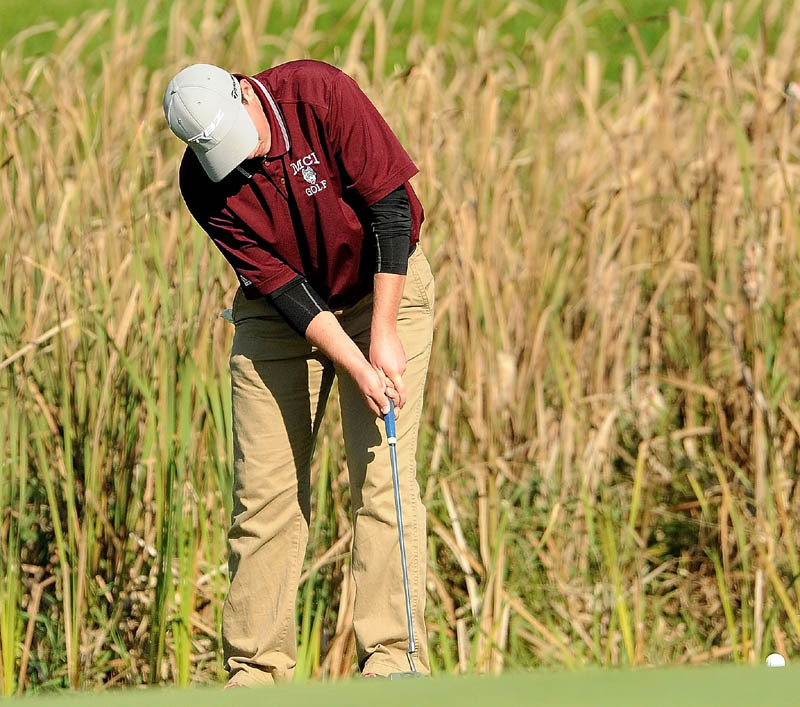 View senior Erik Larrabee and Maine Central Institute junior Gavin Dugas each shot 78 to finish tied for fifth place. “I rolled it pretty good I just didn’t make any putts,” said Dugas who shot 74 in last week’s team championships. Larrabee failed to qualify last year. Also in Class B, MCI’s Carter Pearl shot 79 to finish in a tie for seventh place, Erskine’s Luke Atchison shot 82 and MCI’s Trevor Kitchin 92. Yarmouth’s Monica Austin and Lawrence’s Kelsie Dessent were in the same foursome as Plourde and both within striking distance of the lead heading into the final hole. Plourde parred the par 4 18th, though, while Austin had an eight and Dessent nine. Austin shot 80 to place fourth while Dessent shot 82 to finish sixth. Pittsfield native Megan Flanigan, who attends the Maine School of Science and Mathematics in Limestone, shot 78 to finish third while Erskine’s Ashley Chubbuck shot 83 to finish seventh. Also among the schoolgirls, Mt. View’s Cassidy Gerrish shot 112 and Madison’s Allison Dean 115. Letourneau bogeyed his last two holes to finish in a tie for first in Class A while Billings double bogeyed his final hole. “Those are two holes I wish I could have back,” said Letourneau, a junior who didn’t qualify last year. Also in Class A, cony’s Ben Leet shot 79 to finish just outside the top 10, and Messalonskee teammates Billy Rollins and Kalib Bernatchez shot 86 and 99, respectively.